If you are exploring the Windows Azure AppFabric Service Bus capabilities and trying the bits out in your projects, the following article may shed some light on where to be on a lookout when it comes to using the netTcpRelayBinding in Streaming mode. By following the recommendations in this article you can maximize the performance of your TCP streaming solutions. The WCF Service receives the data stream and relays it further to a SQL Azure database-based queue so that the data becomes available for processing. The Windows Azure AppFabric Service Bus makes the above scenario shine as it makes it easy to connect an existing on-premise BizTalk infrastructure with cloud-based service endpoints. While it’s truly an eye-opener, there are several observations that we have made as it relates to data streaming over TCP. As referenced above, the cloud-hosted WCF service exposes a streaming-aware operation that takes the inbound data stream and makes sure that it safely lands in a SQL Azure database. Specifically, we are reading the data from an inbound stream into a memory buffer in chunks, and then flush the buffer’s content into a varchar(max) field using the Write() mutator operation supported by the UPDATE command. // Some unrelated content was omitted here and the code below was intentionally simplified for sake of example. // multiples of 8040 bytes. There is an explanation for the behavior in question. First of all, some fluctuation in the read chunk size bubbled up by the OSI transport layer is expected on any TCP socket connection. With TCP streaming, the data is being made available immediately as it streams off the wire. The TCP sockets generally don’t attempt to fill the buffer completely, they do their best to supply as much data as they can as timely as they can. Secondly, when we set the buffer size to 80400 bytes, we unintentionally attempted to ask the TCP stack to buffer up to 53 times of its Maximum Transmission Unit (MTU) value as well as potentially exceeding the maximum TCP receive window size. This is an unrealistic ask. So, why do these small incremental (sometimes appearing to be random) chunks project potential concerns to a developer? Well, in our example, we are writing data into a SQL Azure database and we want this operation to be as optimal as possible. Writing 2, 6, 255 or even 4089 bytes per each call doesn’t allow us to achieve the desired degree of efficiency. Luckily, a solution for this challenge comes across extremely well in the following simple approach. // Note the name changed from Read to ReadBuffered as we are now using the extension method. As an extra benefit, we reduced the number of database transactions since we are now able to stream larger chunks of data as opposed to invoking the SQL command for a number of smaller chunks as it was happening before. Streaming is a powerful and high-performance technique for large data transmission. Putting on the large Azure sun glasses, we can confidently say that the end-to-end streaming between on-premise applications and the Cloud unlocks extremely interesting scenarios that could make impossible possible. In this article, we shared some observations from our recent Azure customer engagement and provided recommendations as to how to avoid a specific “gotcha” with WCF streaming over netTcpRelayBinding in the Windows Azure AppFabric Service Bus. When implemented, these recommendations may help the developers increase the efficiency of the application code consuming the WCF streams. How to use the ConfigurationManager Class in Visual Studio? Why don’t I see the ConfigurationManager Class? Whats wrong with ConfigurationManager class why don’t I see it? You may have noticed that WorkflowServices have two ways of operating. One way is to pass message content and the other way is to use message parameters. I have always used message content because it seemed like the easiest thing to do. Today I wanted to write some test code that would new up a client proxy with a Channel factory without having to go through generating a service reference. I was just writing some test code so I figured I would create an interface that looked like the workflow service and create the proxy. Message=The message with Action ‘<a href="http://tempuri.org/IService1/GetData’">http://tempuri.org/IService1/GetData'</a> cannot be processed at the receiver, due to a ContractFilter mismatch at the EndpointDispatcher. This may be because of either a contract mismatch (mismatched Actions between sender and receiver) or a binding/security mismatch between the sender and the receiver. Check that sender and receiver have the same contract and the same binding (including security requirements, e.g. Message, Transport, None). As you can see the WCF service wraps up the parameters inside a request/response message where the Workflow Service (using message content) simply serializes the data into the message body. The WCF Client proxy (created by the channel factory based on the interface) does not understand the message content as sent by the Workflow service. Of course you can always add a service reference and generate the correct client proxy. The fix for this is to change the way that the messaging activities deal with the content. If you want to create a Workflow Service where the content looks like it would for a WCF service then you need to use Message Parameters. And for the response you need to name the return value (MethodName)Result. Now when I run it everything is working as it should and the Workflow Service request response content looks exactly like the WCF Service content. If you are still having trouble, don’t forget to set the ServiceContractName (and namespace if necessary) on each of the receive activities. This is the twenty-fifth in a series of blog posts I’m doing on the VS 2010 and .NET 4 release. Today’s blog post is the first of several posts I’ll be doing that cover some of the improvements we’ve made around web deployment. I’ll provide a high-level overview of some of the key improvements. Subsequent posts will then go into more details about each feature and how best to take advantage of them. Deploying your web application to a server is something that all (successful) projects need to do. Without good tools to help you, deployment can be a cumbersome task – especially if you need to do it manually. VS 2010 includes a bunch of improvements that make it much easier to deploy your ASP.NET web applications – and which enable you to build automated deployment procedures that make deployment easily reproducible. The deployment features support not just deploying your web content – but also support customizing your web.config file settings, deploying/updating your databases, and managing your other dependencies. You can kick-off deployments manually – or via automated scripts or as part of an automated build or continuous integration process. Below is a high-level overview of some of the key new web deployment features in VS 2010. I’ll do subsequent posts that provide more details on how to use/customize each of them. Visual Studio 2010 includes a new “Publish Web” dialog that you can use to quickly deploy a web application to a remote server. 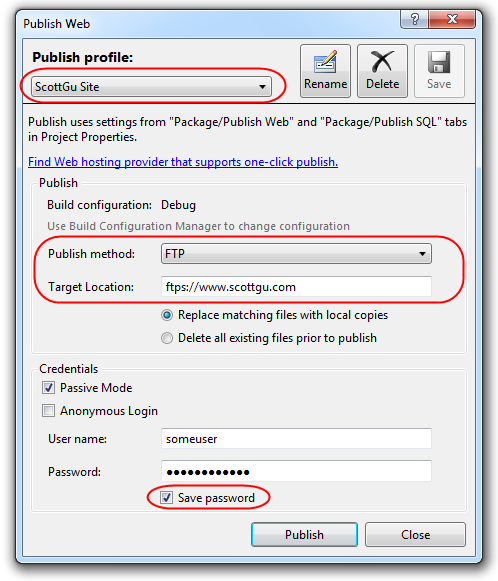 Selecting this will bring up a “Publish Web” dialog which allows you to configure publish location settings. You only need to define your publish settings once – you can then save them as a named “Publish Profile” to enable you to quickly re-use them again later. 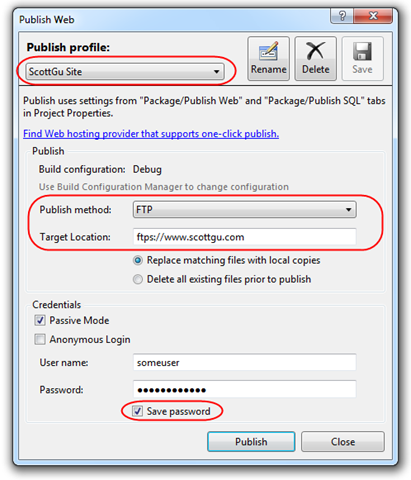 Above I’ve created a “ScottGu Site” profile, and configured it to deploy via FTPS (a version of FTP that uses SSL) to a remote server. To deploy over FTPS select the “FTP” node in the drop-down, and then prefix the server location you want to publish to with the “ftps://” prefix. Note that you can either re-enter your password each time you deploy – or save the password for future uses in a secure location (just click the “Save Password” checkbox to do this. 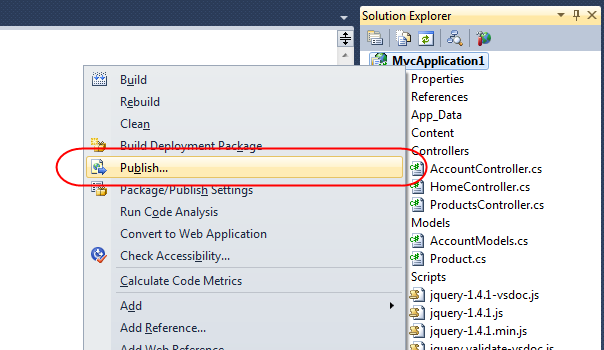 In addition to supporting FTP/FTPS, VS 2010 also supports a more powerful publish mechanism called “Web Deploy”. Web Deploy (earlier known as MSDeploy) provides a much more comprehensive publishing and deployment mechanism than FTP. It not only allows you to publish files, but also allows you to publish IIS Web Server Settings, Database Schema/Data, Database Change Scripts, Security ACLs, and much more. Web Deploy can be used to deploy applications both to a single server, as well as to multiple servers within a web farm. Web Deploy is also now supported by many inexpensive Windows hosting providers (some as cheap as $3.50/month for an ASP.NET + SQL account). You can find great ASP.NET hosters that support Web Deploy by visiting this page: http://asp.net/find-a-hoster. Clicking the “Publish” button within the “Publish Web” dialog will publish a web application (and optionally associated database schema/content) to a remote web server. Just select your publish profile from the toolbar drop-down and then click the publish icon to the right of it to begin deploying your application. In most real-world deployment scenarios, the web.config file you use for development is different than the one you use for production deployment. Typically you want to change environment settings like database connection-strings, making sure debug is turned off, and enabling custom errors so that end-users (and hackers) don’t see the internals of your application. You can maintain a separate transform file per Visual Studio build-environment. For example, you could configure your project/solution to have a “Debug”, “Staging” and “Release” build configuration – in which case VS will maintain three separate transform files for you. VS will automatically apply the appropriate one at deployment time depending on what your VS environment is set to. I will dive deeper into how to perform web.config file transformations in a future blog post. VS 2010 allows you to optionally deploy a database, along with your web application files, when are using the “Web Deploy” option as your deployment mechanism. Databases deployed this way can include both schema and data, and can optionally also include change scripts to update existing databases. I will dive deeper into how to perform database deployments in future blog posts. VS 2010 also supports a packaging option that enables you to package up your ASP.NET Web Application (together with its dependencies like web.config, databases, ACLs, etc) into a .zip based deployment package file that you can optionally hand-off to an IT administrator who can then easily install it either via the IIS Admin Tool or via a command-line/powershell script. The deployment package you create can optionally expose application configuration settings that can be overridden (like directory locations, database connection-strings, etc). When using the IIS7 Admin Tool, the install wizard can prompt the administrator for each setting to be customized – enabling you to provide a clean customization experience without having to write any custom code to-do so. The settings can also obviously be passed as arguments on the command-line when using a command-line or Powershell script to deploy the application. This will compile your application, perform appropriate web.config transforms on it, optionally create .sql scripts for your database schema and data files, and then package them all up into a .zip deployment package file. Adjacent to the .zip file you’ll file a deployment script file that you can use to automate deployment of the package to a remote server. 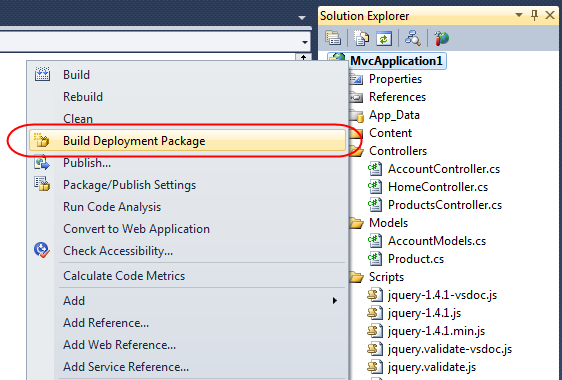 I will dive deeper into how to create web deployment packages in future blog posts. Most of the VS 2010 web deployment features that I described above are built on top of MSBuild tasks & targets. The “Team Build” feature of TFS also uses MSBuild, and supports running nightly builds, rolling builds, and enabling continuous integration. This means that you can create deployment packages, or automatically publish your web applications from a Team Build environment. I will dive deeper into how to enable this in future blog posts. 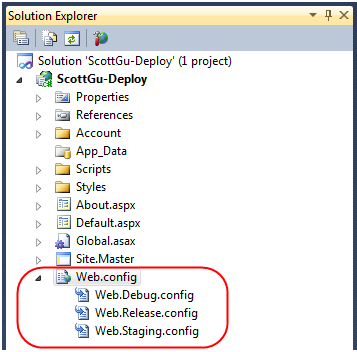 Today’s blog post covered some of the new VS 2010 web deployment features at a high-level. All of the above features Iwork with both VS 2010 as well as the free Visual Web Developer 2010 Express Edition. Hopefully today’s post provided a broad outline of all the new deployment capabilities, and helped set context as to how they are useful. In future posts I’ll go deeper and walkthrough the specifics of how to really take full advantage of them. One thing I have not tackled until today was how to test a Workflow Service in a .xamlx file. When I started out this morning working on it I realized that there isn’t a great deal of information about how to do this available anywhere. Here is what I came up with. Look at this test and tell me what you think. The Windows Azure AppFabric LABS August release is scheduled for August 5, 2010 (Thursday). Users will have NO access to the AppFabric LABS portal and services during the scheduled maintenance down time. LABS AppFabric Service Bus, Access Control and portal will be unavailable during this period. Additional impacts are described below. Existing accounts and Service Namespaces will be available after the services are deployed. However, ACS Rules, Issuers, Scopes, and Token Policies will NOT be persisted and restored after the maintenance. Users will need to back up their data if they wish to restore them after the Windows Azure AppFabric LABS August Release. Also note that the Service Bus Multicast with Message Buffers features, which have been available in LABS since March 2010, will be temporarily removed from the LABS environment. The team is working on an alternative approaches to these features. Thanks for working in LABS and giving us valuable feedback. Once the update becomes available, we’ll post the details via this blog. Stay tuned for the upcoming LABS release! How can I compare different versions of Word document in Sharepoint? Sharepoint is pretty interesting to use on an enterprise level. More and more companies are adopting the Sharepoint way to share and collaborate documents and to do their Knowledge Management. If you are used to using Sharepoint, I am sure you have used it to upload your word document and share it across the team. Earlier this week the Visual Studio team released updated VS 2010 Keyboard Shortcut Posters. These posters are print-ready documents (that now support standard paper sizes), and provide nice “cheat sheet” tables that can help you quickly lookup (and eventually memorize) common keystroke commands within Visual Studio. The posters are in PDF format – enabling you to easily download and print them using whichever paper size is in your printer. You can download the VS 2010 Keybinding posters in PDF format here. Posters are available for each language. 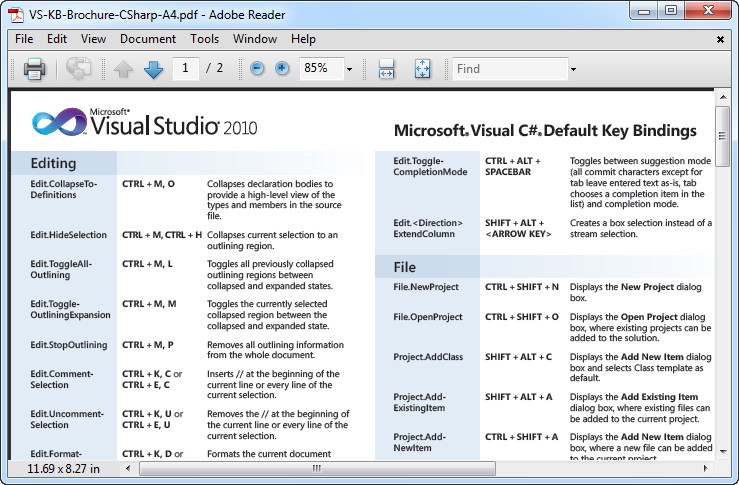 Simply look for the download that corresponds to your language preference (note: CSharp = C#, VB = VB, FSharp = F#, CPP = C++).